Yvonne Ng is Senior Archivist at WITNESS, an organization that “trains and supports activists and citizens around the world to use video safely, ethically, and effectively to expose human rights abuse and fight for human rights change.” Yvonne currently serves on the Advisory Board of Documenting the Now, and previously worked as a Research Fellow for the Preserving Digital Public Television Project. Thomas: To kick things off, how did you find yourself working for an organization like WITNESS? Were there particular experiences that you had that shaped your interest in the work? Yvonne: I was very lucky to end up at WITNESS, an organization whose mission I truly believe in, and in a position that coincides with many of my interests. As Senior Archivist, I have the opportunity to collaborate with people around the world who are dedicated to defending human rights, to help develop new workflows for archiving video outside of traditional institutional contexts, and to manage a unique collection of human rights video. Since joining WITNESS in 2009, my job has grown to incorporate more outreach, engagement, and training functions, which has given me the opportunity to learn from so many people outside of archives, while also remaining active within the professional archives community. Before joining WITNESS in 2009, I was a research fellow on the Preserving Digital Public Television project, where I studied economic and other factors affecting the sustainability of digital preservation initiatives in public television. Prior to that, I graduated from the Moving Image Archiving and Preservation (MIAP) program at NYU. My MIAP thesis focused on small arts organizations with audiovisual collections, and developed criteria for assessing their readiness to initiate preservation projects. So I came to WITNESS with a fresh awareness of the challenges of sustaining archives in non-institutional settings, as well as the potential value of archived collections to all different kinds of users. Before I moved to New York for the MIAP program, I worked at the Canadian Filmmakers’ Distribution Centre in Toronto, one of the oldest artist-run centers in Canada with an amazing de facto archive of important experimental works on film. I was also enrolled in a graduate program in film studies at York University. For a time, I thought I would pursue a Ph.D in film studies, but while at York I became interested in working in a more hands-on way with media, with the people who created it, and in audiovisual archives. Film theory and academia started to seem distanced from the actual systems of media production, distribution, preservation, and use. Throughout my life, I have always been involved in activist- or art-oriented avocations, ranging from community radio starting in high school, activist-led student government in undergrad, and a collective that made art with kids. These days, I am really proud to be part of XFR Collective and Community Archiving Workshop. Working at WITNESS is the perfect fusion of so many aspects of my life and interests – human rights, archiving and preservation, video, community collaboration, creative production … the list goes on. Thomas: Thinking about your work with one or more activist groups, can you describe specific challenges that WITNESS sought to help with? We try to communicate the value of basic archival practices, such as keeping backups in geographically dispersed locations. Yvonne: When it comes to video archiving, the primary challenges faced by the groups we work with are limited resources, and the fact that they are working in contexts where human rights abuses are taking place and their security is a concern. Groups that have implemented archival workflows tend to be ones that do a lot of video production and post-production, like La Sandia Digital in Mexico or Refugee Law Project in Uganda, and others focused on collecting evidentiary documentation, like SyrianArchive.org. For other groups that are not directly concerned with media management or preservation as part of their everyday activities, it can be difficult to set aside the additional time and resources to implement archival workflows. We try to communicate the value of basic archival practices, such as keeping backups in geographically dispersed locations. Unfortunately, the importance of these practices sometimes does not sink in until something bad happens, like having a YouTube account taken down or having a hard drive fail. 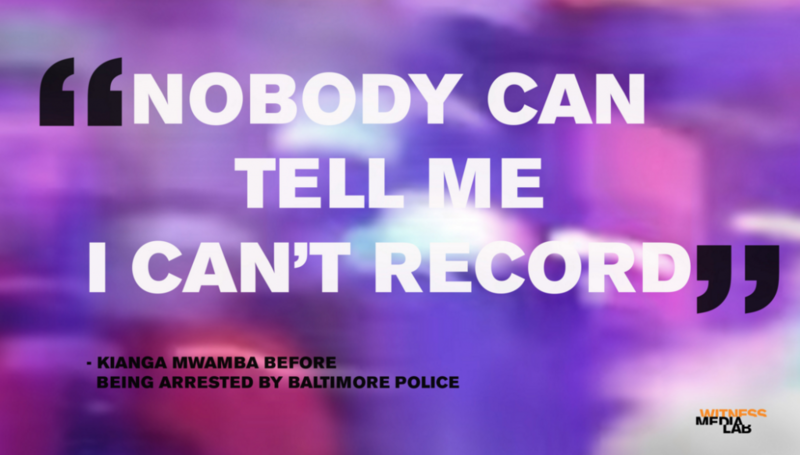 A positive example that I like to share is that of Kianga Mwamba, a woman who recorded her mistreatment by the Baltimore police on her phone. The recording was “accidentally” deleted while her phone was in police custody, but she fortunately had the foresight to activate her remote backup ahead of time. Because of that small act, she was later able to retrieve a copy of the video from the cloud and use it as evidence in her successful suit against the police department. WITNESS provides archival training resources, in-person workshops, and ongoing consultation and collaboration. Our freely available resources include the Activists’ Guide to Archiving Video, which received the 2014 SAA Preservation Publication Award, and a number of short training videos. In our resources and workshops, we try to give guidance that is practical and realistic for small human rights groups, which are not necessarily what traditional collecting institutions might consider best practices. I do not, for example, talk much about metadata standards, but do brainstorm with groups about the kinds of information they want to keep track of, why it’s useful to record that information in a consistent way, and at the same time discuss what information might put them at risk. While I think we have been successful helping some groups with practical activities like collecting, organizing, and cataloging their videos, our training resources do not solve larger sustainability challenges, like staffing and the cost of ongoing collections maintenance. One way that groups might address this, however, is through local networks and collaboration – a good example of this is our partnership with XFR Collective. One of the biggest ongoing challenges is of how to archive and preserve, while at the same protecting video documentation from authorities that seek to seize it, through subpoenas or other means, and use it against people. There are a variety of approaches to mitigating harm, such as concealing identities, informed consent, and encryption, but these are not always sufficient in every case. Thomas: It is clear from your comments above that there is often an immediate tension between the ability to capture and share digital media with relative ease and an awareness of how the data and relatively automated systems of description around them hold the potential to endanger the creator. What technical solutions have been developed to help groups you typically work with? Yvonne: A number of technical tools are available that can make documenting abuse safer for victims, activists, and witnesses. There are dedicated apps, like CameraV, which we partnered with the Guardian Project to create. CameraV allows a user to capture important metadata from the device at the time of recording and then secure the video and data from unauthorized access through password-protection and encryption. Most people will not have a dedicated app like CameraV installed on their phones just in case they witness an event, of course, so it is important that they are aware of how to operate securely with their available settings and technologies. My colleague Morgan Hargrave wrote a great blog post that outlines some of these basic practices, like securing your device with a strong passkey, setting up automatic cloud backup, knowing your rights, and being conscious of potential risks before you share your video. Knowing that people will usually use widely available tools and services rather than dedicated apps, we also work with technology companies to encourage the development of built-in security features that are easy to use and benefit all kinds of users beyond human rights defenders. The YouTube Custom Blurring tool, for example, makes it easy for users to obscure identifying information like faces and license plates when they share their videos. Thomas: You’ve mentioned explicitly and implicitly, efforts you make to balance the needs of the groups you work with, with professional archival practice. What framework or ethic guides you as you walk that line? What suggestions do you have for others working in related capacities? I think that meeting the needs of the groups we work with is professional archival practice. Yvonne: I wouldn’t frame it as a balance between those two things; I think that meeting the needs of the groups we work with is professional archival practice. That is, it’s the job of a professional archivist to be able to look at existing standards and best practices and judge how they can apply or be adapted to suit particular situations, which are almost always less than ideal. But in terms of what frameworks or ethics guide my professional practice, I guess I can point to a few things. First, on the most basic level, I try to approach my work always keeping in mind human rights principles of dignity, equality, inclusion, and accountability. In the day-to-day, this means prioritizing people’s safety and well-being, working in participatory and inclusive ways, and supporting and following the lead of activists working in their communities. With regard to our archival collections at WITNESS, we have internal guidelines on access and use that emphasize our responsibility to people depicted in the footage, people who recorded the footage, and to communities affected by human rights abuse. 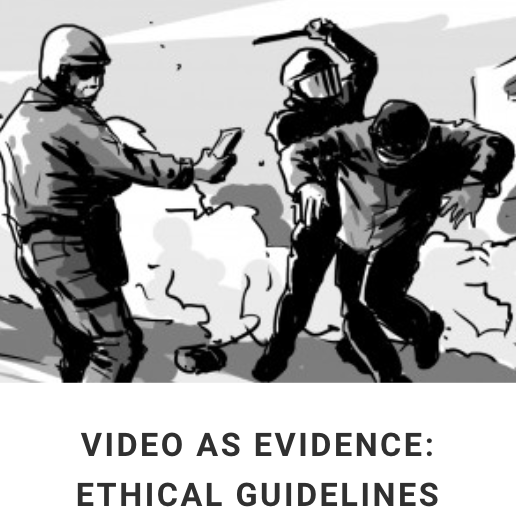 The Ethical Guidelines for Using Eyewitness Videos published by the WITNESS Media Lab, aimed at people collecting and curating video from the web, reflects these principles as well. Michelle Caswell draws a useful framework for human rights archiving that she calls a “survivor-centered approach,” which resonated a lot with me when I read it last year. I appreciate her assertion of an ethical imperative to prioritize survivors of human rights abuse and victims’ families over other stakeholders in the archive, like academic researchers. She also calls for an approach to human rights archiving that is participatory and inclusive, that embraces its work as a form of activism, and that is able to look critically at itself. I suppose the suggestion I would have for others is similar to what Caswell argues for in her article, which is to be self-reflective about our role as archivists, and not to hide behind the false idea that archiving is a “neutral” act. The work we do has value, so it’s important to think about who it should serve and where we want to put our energy. Thomas: Whose data praxis would you like to learn more about? Yvonne: I’m always on the lookout for smaller organizations and groups with media archives. I’m interested in learning about their workflows, what systems and tools they use, their collections, and their specific challenges. There are many ways that groups can manage and preserve video with limited resources, and it’s instructive to hear about as many real-life examples as possible. Thomas Padilla is Visiting Digital Research Services Librarian at the University of Nevada Las Vegas. He publishes, presents, and teaches widely on digital scholarship, digital collections, Humanities data, data curation, and data information literacy. He is Principal Investigator of the Institute of Museum and Library Services supported, Collections as Data. Thomas is a member of the Association for Computers and the Humanities Executive Council (2017-2021), the Global Outlook::Digital Humanities Executive Council, the Integrating digital humanities into the web of scholarship with SHARE Advisory Board, and the ARL Fellowship for Digital and Inclusive Excellence Advisory Group. Data Praxis highlights a range of perspectives on the practice of digitally inflected research, pedagogy, curation, and collection building and augmentation. Topics span methods and tools in the context of research questions and/or exploratory trajectories, and extend to consider reflections on data definition, access, curation, sharing, and reuse.